A letter was written to Transylvania Baptist Association on June 28, 1950 requesting a meeting of several of the churches with a group of Christian believers who desired to organize a church. On July 2, representatives of Glady Branch, Little River, Pisgah Forest, Enon, and First Baptist Church met with this group which had been meeting for worship in the home of Mr. and Mrs. Homer Corn since June 18. After this meeting, the Association granted permission for Grace Baptist Church to become a recognized church with six charter members: Ed and Viola McGaha, Mary Elizabeth McGaha, Ruth Stiles, Rhoda Stiles, and Mrs. Homer Corn. 37 more people joined soon after, bringing the initial membership to 43. Reverend John A. Cox accepted the call to be the church’s first pastor on July 16, 1950. The church purchased the current property from Mr. F.H. Holden and began construction of the building in 1950 as well. 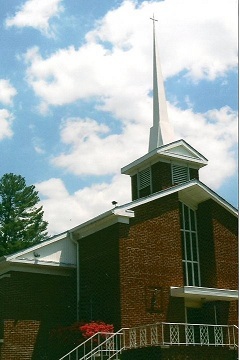 The building was constructed by Pastor Cox and members of the congregation. Until the spring of 1951, they met in a small, rented house near the present day location. They moved into the finished basement in May 1951. The first Homecoming service, called a singing convention, took place on June 15, 1951. The first wedding was held in the new facility on May 17, 1953, with the marriage of A.J. and Belva Monteith. On May 31, 1953, Pastor Cox became full-time and moved into the newly constructed parsonage, which was also built by the pastor and the congregation. In 1954, the sanctuary was completed and the basement was converted to Sunday School classes. In May 1962, the church purchased the adjoining property below the church facility. It has been used for recreation and outreach events over the years, but plans have been drawn up for a new structure that would serve as a larger fellowship hall and additional educational space. In December of 1963, Pastor Cox retired as pastor.